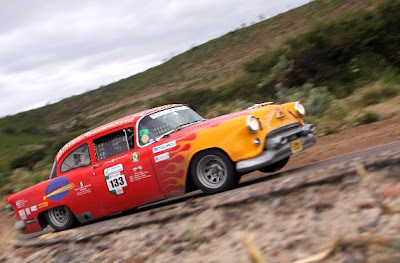 I hate to say it but I'm still living the awesome memory of 2007 when my good friend and teammate Jon and my son and I ran the 20th anniversary La Carrera Panamericana. Not only did we finish but in fact we accomplished something I have never heard of any other team doing in their first attempt... we finished in the top 8 overall. Not only are we extremely satisfied with our achievement but the friends we made along the way are a bonus that is as rich and rewarding as any treasure ever found in the Sierra Madres. It was exciting, adventuresome, rewarding and there are more than 10,000 more adjectives that couldn't possibly describe it all. But what I can tell you is once you have been there you will never forget it, regardless of the outcome. Fortunately, for Jon, Will and myself it's one we will not soon want to forget. What does the future hold in store for us now? I'm not sure but it most certainly holds the dream of returning and knowing what to expect rest assured next time we won't be holding it back to 80 percent. Today, one of my new La Carrera Panamericana friends sent me the best possible New Years gift anyone could have sent. 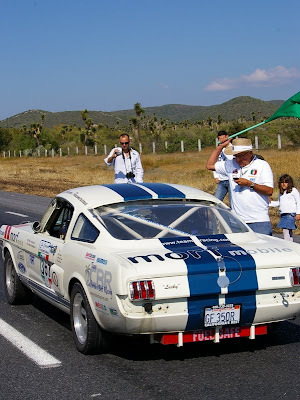 Johnny Tipler, author of the "LA CARRERA PANAMERICANA 'The World's Greatest Road Race'" sent me some photos from across the pond of Jon and I tearing up some memorable highways with Lucky the GT350R in Mexico. I can't begin to thank him enough let alone try to remove the smile from my face. Every time I see these I find myself strapped in Lucky's seat and can feel all that awesome power and handling all over again as if it was only minutes ago. Thanks Johnny! Is this an awesome photos of Mocket's Rocket or WHAT! CLICK HERE for a truly great look into what it's like to tag along with what has to be the greatest race in the world. Or maybe it's more than just a great race... Maybe it really is a way of life. 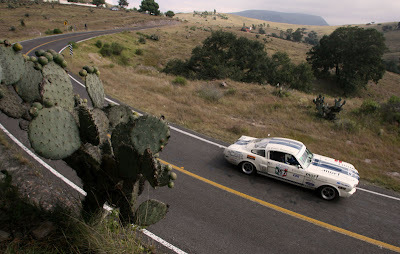 Labels: La Carrera Panamericana "The World's Greatest Road Race"
Happy La Carrera Panamericana Holidays! 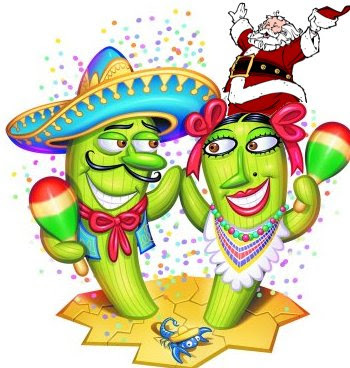 I just wanted to take time to express my sincere appreciation to everyone who visits this blog and I look forward to this Christmas and another new year of friendships with all of you from all over the world. 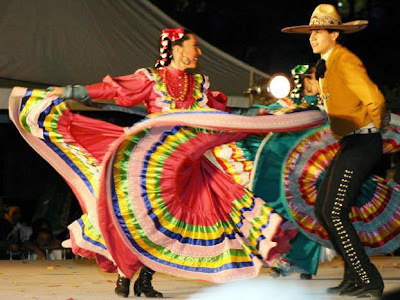 The Northern California Carrera Panamericana fiesta has been scheduled at the Club Sportiva, 840 Harrison Street, San Francisco, 94107, 6-9 PM. The club’s phone number is 515.978.9900. A contribution of $30 per person for food and beverages is requested, since this will be catered event. Please RSVP. Anyone is invited. We will show a video or two, and review next's years plans for La Carrera. 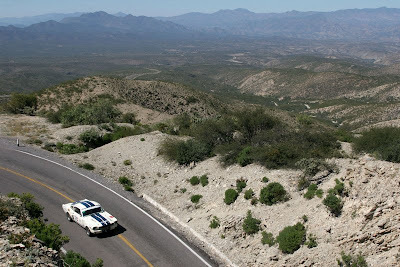 We will also review the upcoming Chihuahua Express (March 27-29), which many consider a warm up for La Carrera. Our hosts will be Che and Carienn Voigt, veterans of the 2006 and 2007 Pan Am. They are members of Club Sportiva and enjoy the exotic cars at their disposal. 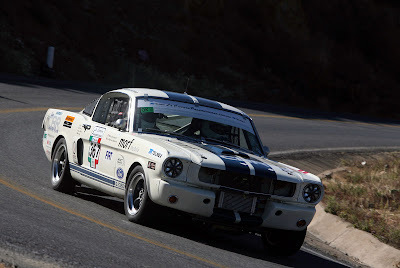 For more information about the club and it collection of automobiles click on http://www.clubsportiva.com/membership/membership.htm. A few Carrera cars may be parked in the club’s garage. Please let me know if you intended to drive your Carrera car to the event. Your contribution for food and beverages should be sent to me by personal check or by PayPal. Eduardo Cademartori hugs friends Courtney Ford, left, and Cam Amici in his hometown of DeLand, Fla. Cademartori, who was in Wisconsin for training with the race-car team. It saddens me to report that Eduardo Cademartori son of renowned Argentinian artist Hector Cademartori has passed away. Many of us knew Hector Cademartori through his passion of art. Hector designed and painted the 20th commemorative anniversary La Carrera Panamericana poster and has been designing the official Carrera Panamericana posters since 1988. 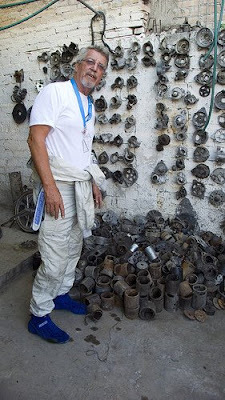 After coming to the U.S. Hector began to specialize in motor racing art and raised a family and began selling illustrations and paintings to racing teams, corporations, magazines and private parties. His art can be found in and on Dan Gurney's All American Racers offices, Indianapolis 500 Yearbook covers, laguna Seca Raceway, California Speedway, the Carrera Panamericana posters, NHRA offices, foreign and domestic automobile and motorcycle magazines, motorcycle manufactures offices and many mother places. 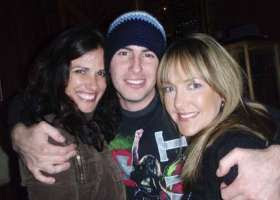 On Sunday, Dec. 7, family and friends of Eduardo Cademartori learned the 27-year-old DeLand man was on life-support at Meriter Hospital in Madison, Wis., with brain and spinal injuries sustained in a fight just one block from Crave Restaurant and Lounge, where Cademartori had been celebrating his arrival in Madison with coworkers. A police officer had found Cademartori unconscious on the downtown Madison sidewalk about 2 a.m. Sunday morning. Two men, ages 19 and 22, were arrested and charged in the assault Sunday. Cademartori had been in Madison about a week in connection with his work as a racing mechanic for Level5 Motorsports. News of the tragedy traveled faster than the award winning racecars Cademartori was highly regarded for working on. Argentina born Cademartori had grown up in Los Angeles, where he graduated from high school and began his career in racing. His work took him all over the United States and the world. About two years ago, he bought a house in DeLand after being hired by BlackForest Motorsports Group, based on the DeLand Municipal Airport. Cademartori quickly became a beloved member of the community through his outgoing nature, genuine personality, positive energy, and a sense of humor that literally many times left friends rolling on the ground laughing. In a very short time, Cademartori had made a home, not just as a resident, but as one of DeLand's familiar smiling faces. 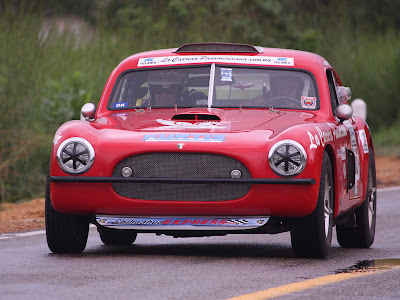 Speaking for the entire La Carrera Panamericana community we would like to express our deepest condolences to the Cademartori family and share our thoughts and prayers. Eduardo leaves behind his mother and father Hector and Florencia and his two sisters Mercedes and Florencia who reside in La Verne, California. Anyone wishing to express their personal feelings I would be more than glad to forward them on to his family. Finally, I made it to the inflatable doll section. I only wanted to buy a standard, uncomplicated doll that could also substitute as a passenger in my truck so I could use the car pool lane during rush hour. Finding what I wanted was difficult. 'Love Dolls' come in many different models. The top of the line, according to the side of the box, could do things I'd only seen in a book on animal husbandry. I settled for 'Lovable Louise.' She was at the bottom of the price scale. To call Louise a 'doll' took a huge leap of imagination. On Christmas Eve and with the help of an old bicycle pump, Louise came to life. My sister-in-law was in on the plan and let me in during the wee morning hours. Long after Santa had come and gone, I filled the dangling pantyhose with Louise's pliant legs and bottom. I also ate some cookies and drank what remained of a glass of milk on a nearby tray. I went home, and giggled for a couple of hours. My grandmother noticed Louise the moment she walked in the door. 'What the hell is that?' she asked. My brother quickly explained, 'It's a doll.' 'Who would play with something like that?' Granny snapped. I kept my mouth shut. My grandfather, a delightful old man with poor eyesight, sidled up to me and said, 'Hey, who's the naked gal by the fireplace?' I told him she was Jay's friend. A few minutes later I noticed Grandpa by the mantel, talking to Louise. Not just talking, but actually flirting. It was then that we realized this might be Grandpa's last Christmas at home. around the room twice, and fell in a heap in front of the sofa. The cat screamed. I passed cranberry sauce through my nose, and Grandpa ran across the room, fell to his knees, and began administering mouth-to-mouth resuscitation. My brother fell back over his chair and wet his pants. Granny threw down her napkin, stomped out of the room, and sat in the car. It was indeed a Christmas to treasure and remember. Later in my brother's garage, we conducted a thorough examination to decide the cause of Louise's collapse. We discovered that Louise had suffered from a hot ember to the back of her right thigh. Fortunately, thanks to a wonder drug called duct tape, we restored her to perfect health. I can't wait until next Christmas! How Do You Know You've Been Bitten By The Racin Bug? Countless times over the years I have been around auto buffs who while looking at some old car whether it be an old clunker abandoned in some farmer's field or something on a trailer with a for sale sign planted in the window. It's then that I notice as they seem to get that glassed over look in their eyes as if they being transported back to some childhood memory or possibly into the future to a place that might be someday. As we look around at all the different styles, shapes, ages and so many other choices one thing is apparent, everyone has his or her own taste as to what they see in a car. This video is a prfect example of the extream measures many will go to to make that vison a reality and how someone can look at a car and see something in it that you or I can not. I can't help but think the exact same "vision" has at one time or another came over anyone who ever looked at a car and said to themselves... "Oh yeah.... 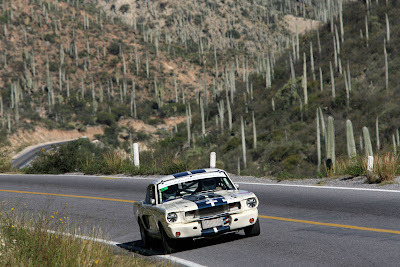 I can just see me in that baby ripping up the highway during La Carrera Panamericana. 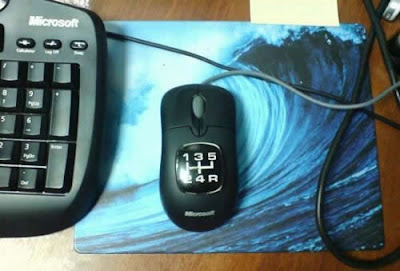 Hmmm." 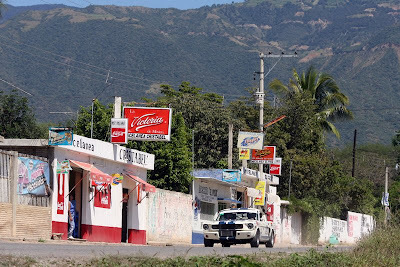 For a very good look at the sights and sounds of what it's like to watch La Carrera Panamericana from along side the road as do many of the fans from Mexico, this is one of the best Youtube videos I have found on the Internet. This second video taken by the same person who took the above video, and even though it was filmed during very lite traffic conditions, it gives a good idea of what a typical transit stage is like. Far from doing speed limit. Bigger Cahones... La Carrera Photographers Or Pilotos? This isn't from La Carrera but it's a good example of what can and does happen. Click on each of the following photos to enlarge. Today I got a note from Clément Marin from Paris France telling me about his new 2008 La Carrera Panamericana book and from the looks of it I think it's going to be a nice addition to my coffee table. After 10 years of taking pictures of the most exotic and extrem road race in Mexico, I decided to make a book of the 2008 edition. You will not find historic data, neither results nor palmares in this book: THIS IS ALL ABOUT PHOTOGRAPHY! The introduction is by 7 time winner Pierre De Thoisy. 88 pages. It's interesting how many famous drivers from NASCAR competed in La Carrera Panamericana not to mention how many cars were prepared or owned by some of the biggest names in racing history. As a matter of fact NASCAR shares a lot of it beginnings in Mexico going back almost 60 years. A lot of these names will not to be recognized by many of todays younger crowd but there are a few of us old timers who do. Hershel McGriff, Bill France, Curtis Turner, Marshall Teague, Clay Smith, Johnny Mantz, Bill Stroppe, Chuck Stevenson, Walt Faulkner, Bob Korf, Ray Crawford, and Jack McGrath are just a few. 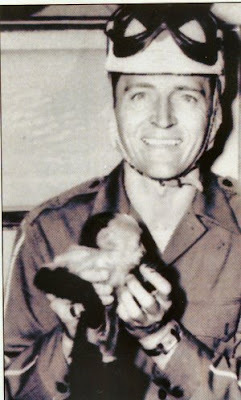 Have you ever heard of Nascar driver Tim Flock whose good luck charm was a real live monkey by the name of Jocko Flocko who used to ride as co-piloto? It's true. Jocko Flocko was a Rhesus monkey and remains the only known "co-driver" in NASCAR history. On May 16, 1953, Jocko helped Tim win the Grand National race at Hickory, N.C. - becoming the only winning monkey to date. Unfortunately, Jocko was forced to retire from "driving" duties two weeks later in Raleigh, N.C.. Too bad, Jocko was one of the cutest co-pilotos around. Here is a photo taken on May 30, 1953 when the one-mile superspeedway in Raleigh, N.C., joined NASCAR and presented a Memorial Day 300-miler. 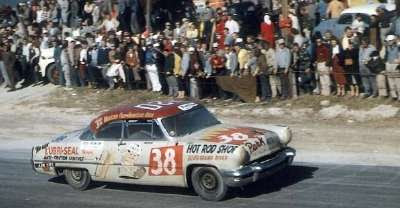 Fonty Flock came from the 43rd starting position to win. Tim Flock fell to third in the final laps when he pitted to remove monkey copilot Jocko Flocko from his car. Driving a 1953 Lincoln that competed in the annual Carrera Panamericana, Tom Cherry whips a quick lap at Daytona. Cherry finished ninth in what turned out to be his only start in NASCAR's premier stock car racing series. Two different numbers were painted on the durable Lincoln -- the #120 that it had in the grueling race over the rugged Mexican terrain, and the #38 that it officially carried in the NASCAR Grand National event. Here is a first hand account as Tim Flock recalls the incident that caused Jockos early retirement. "I actually raced with a monkey, which I named Jocko Flocko, for eight races in 1953. It started as a publicity stunt, and we gave him his own driving uniform and a specially designed seat. Back then the cars had a trap door that we could pull open with a chain to check our tire wear. Well, during the Raleigh 300, Jocko got loose from his seat and stuck his head through the trap door, and he went berserk! Listen, it was hard enough to drive those heavy old cars back then under normal circumstances, but with a crazed monkey clawing you at the same time, it becomes nearly impossible! I had to come into the pits to put him out and ended up third. The pit stop cost me second place and a $600.00 difference in my paycheck. Jocko was retired immediately. I had to get that monkey off my back!" To say Ron Lee and his beautiful wife are car buffs would be like saying there is sand on the beach. Without a doubt one of the most exciting private car collections I have seen was the day I spent at Ron Lee's home but as is the case with any collection, there is always one that stands out for one reason or another. In this case it was Ron's beautiful 55 Kurtis. 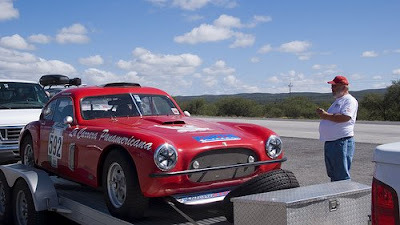 Not only is this car beautiful but to know the historical significance and the players involved with it's involvement in La Carrera Panamericana is worth a read all by it's self. To learn more about Ron's Kurtis CLICK HERE. Ron and his wife being serenaded during dinner at the Panamericana Gala in San Miguel de Allende. 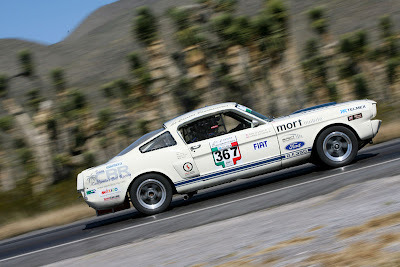 In my opinion I must say I am so happy that Ron took this car to this years La Carrera Panamericana. Speaking from personal experience I can tell you I have met so many pussies (for lack of a better word) that unlike Ron and myself have unique cars but are afraid to get them dirty let alone push them to the limit. 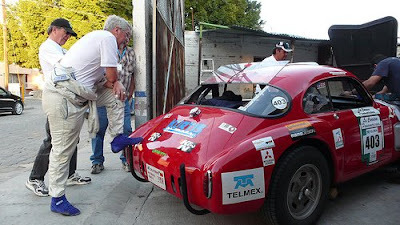 In the mean time in Ron's own words, here is his personal account of his recent adventure in the 2008 La Carrera Panamericana. Well we did it -- it was less than successful, but a lot of fun. Very nice people both in the race, supporting it and particularly in Mexico. What a beautiful country! We towed the Kurtis for eight days (two nights in San Miguel de Allende – my favorite city in Mexico). 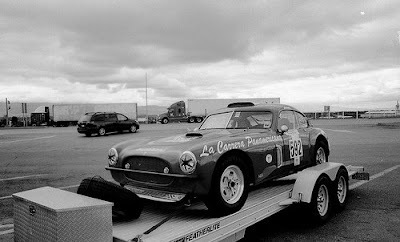 The worst night towing was the night we arrived in Laredo Texas. We had dinner; we were supposed to cross the border (walking) for permits at 9:00 PM and left about 10:00 PM. We stood in line for three and one half hours and got to bed at 1:45 AM. We then got up that morning at 4:45 for an early departure! The road south to Coatzacaolcos is really, really, bad. Potholes eighteen inches deep, two to three feet wide. Some even had candles around them to show the way to heaven! Tolls run about twenty dollars a pop and we must have hit at least ten. Gail does a yeoman’s job driving. Yikes, I am too old for this! We arrive Wednesday in Tuxtla Gutierrez (abut sixty miles north of Guatemala) for our first day. Got our car checked for technical inspection, etc. No problems. We did our first day of driving the next day (qualifying and came in, I think, 57th out of 106 entries – no big deal as we were taking it easy). The next day we finished, again I think, in 27th place finishing in Oaxaca, my next favorite city. Not too bad for an old car with vintage suspension and a relatively small engine. The next day was the worst and our last (the race is seven days long). We were driving to Mexico City. We were on sort of sketchy roads, like Angles Crest but much worse surfaces. A beautiful Sunbeam Tiger went off the road and tumbled down about 45 feet and totaled the car. A very nice 350 Mustang “pranged” a large rock and totaled it – shortened by about three feet! No one hurt at this time. I got the tail out way too far but recovered. In the process my left leg began to cramp, which caused me to coast about a half a mile down the road. Then my left hand cramped to the point I had to pry it off the wheel with my right hand. The car was not running too well. I thought we got a bad load of gas or the altitude was taking its toll. It turned out my alternator died (brand new Delco Remy 100 amps) and we were miss firing. 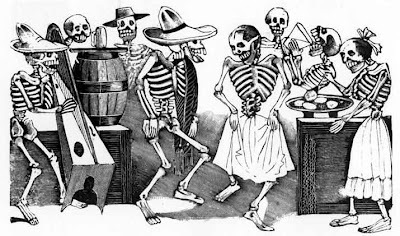 We stumbled into Tehuacan at about noon, which had a fiesta going for our all our benefit. Man! We couldn’t run the radiator fans so the heat was building – 220, 240, 250! We ended up guided by the police into the front of a very large concert stage, which had speakers larger than the Hollywood bowl! We were supposed to be there for sixty minutes but we were stuck “dead in the water”. It was the loudest music I ever heard and went on with eight young beautiful Mexican girls dancing for three and one half hours non-stop!!!!! 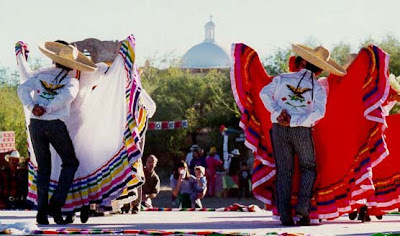 There were at least five thousand Mexicans having a very nice and noisy fiesta in a very small zocollo (square). They treated us like “rock stars! Signing autographs, pictures with everyone, beers floating through the place like water. At this time my co-pilot Jack is not looking too good. He threw up and then turned the color of grey concrete and started to fade. I took him to get some food but it wasn’t working. We found a doctor and pharmacy and got him some medicine for his diabetes that he left in the support truck that went ahead to Mexico City. Next, two very nice young men helped us out who were with a local car club. They telephoned an automotive electrical guy who took us to his shop and replaced the alternator, starter solenoid and brackets. Jack, my co-pilot went ahead with Gerie Bledsoe (North American Co-0rdinator) who was kind enough to stay with us. We headed for Mexico City. At this time it is about 7:00 PM and getting dark. We violated the one rule everyone said to hold - - “don’t drive in Mexico at night ” and particularly in Mexico City. 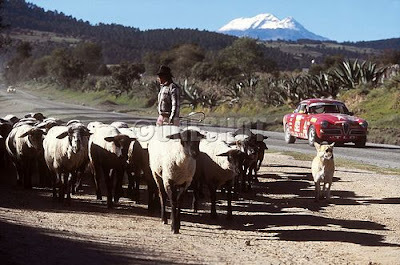 We were running north from Puebla, maybe a hundred miles, which takes you from about five thousand feet to over ten thousand before entering a city of 20 million. The Kurtis is running pretty good as it is cool and damp. Pretty soon it is more than damp - - it is raining fairly hard! I have no side windows, no windshield wipers, the RainX is taken over by bugs, my vents are open and the rain is filling my left shoe and coming in on my glasses! This is while we are exceeding sixty and trying to follow a truck and trailer not to get lost! It was brutal! We arrive safe at about mid-night. I am exhausted, Jack is totally out of it and I just want to sleep. I make an executive decision. Let’s go home! We did. Jack took about three days to recoup. We had a great time - - probably won’t do it again, but have no regrets. Beautiful country, nice people, good camaraderie and a lot of fun!